Almost exactly two years ago that I had a thought: most subwoofers don't actually produce true low bass (mostly just loads of mid-bass), but what is actually possible within domestically acceptable bounds? The fundamental thing is that air is a fluid and when you compress it, it flows away. As frequencies get lower, much more air flows away before it gets compressed, and as a result to produce the same level a lot more air has to be moved, hence why bass speakers are bigger. While there are extreme approaches to this, the costs and practicality don't fit with most people. Other approaches include better matching the driver to the air (horns), generating resonances to increase output at low frequencies (reflex, passive radiators) and many more combinations. 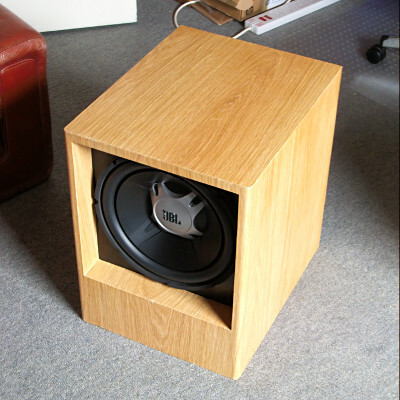 The fundamental thing is that the pressure on the rear of the speaker is opposite and would cancel that at the front, so in most cases it gets simply trapped in a box or used to drive matching/resonances. 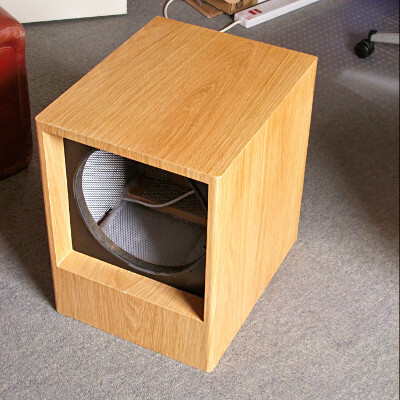 When a sealed box is used, the driver has to push against the air in the box as well as in the room which raises the resonant frequency and limits low frequency output. My idea was to forget about all the details of getting an even response for the moment, and just look at what is necessary to hit decent sound levels at very low frequencies. I decided on a 100dB target at 20Hz at 1m, by which time most rooms are giving quite a lot of low frequency gain and so it's plenty. The biggest limiting factor at very low is almost always the Xmax (amount of travel of the motor/cone) to shift the larger amounts of air. Increasing the diameter of the cone reduces the requirements, but makes it less attractive in the domestic environment. After searching around for cheap high-Xmax drivers I found that there are quite a few Car Audio drivers available cheaply with decent Xmax figures. While these are not exactly precision transducers, for the purposes of my experiment, they are a good candidate. After trying several sealed box designs I settled on the JBL GT5-12 which has a 14.2mm Xmax in a 12" driver. I picked one up on eBay for £16. In a 39l enclosure it can theoretically produce about 100dB down to 23Hz at 400W (likely OK in bursts with 275W RMS spec and 1100W peak), falling to 91dB at 14Hz by which time I expect plenty of room gain helping. But as it turns out, moving to a 22l enclosure pushes the 100dB roll-off to 27Hz and still gives around 90dB at 14Hz. That's a very small enclosure for the amount of bass. Still ample in the domestic environment. I wasn't going to go to all the cost and effort to build a custom amp so picked up a BK BSBPV 300 plate amp on eBay for £54 which is less power than I would have liked, but not low enough to become a problem. This is not a bad amp (much better than some others that have serious input design problems with severe clipping concealed by the lack of HF output of subs), but the protection does seem a bit over aggressive which prevents getting the most out of it. Now that I've got the output sorted I turned my attention back to getting the response flat which is where most people fail. This essentially comes down to EQ, but fortunately for simple sealed box enclosures, Siegfried Linkwitz already worked out a circuit known as the "Linkwitz Transform" which provides the EQ to take one Fb/Qb combination and transform it to the output of another arbitrary Fb/Qb. As you notice I put a lot of wadding in to help make the most of the space, which also means the actual behaviour doesn't match theoretical Fb/Qb for this size enclosure. Also I have lined the inside with steel mesh for some level of magnetic screening which is less of a problem these days, but I have some retro electronic test kit with sensitive CRTs so worth the precaution. It's also been designed to allow my Roomba to run around the base of it without damaging anything fragile. It looks much better sanded down so the filler in the veneer joins is hidden, and then lacquered. I aimed for an EQ to give Fb = 16Hz / Qb = 0.6 giving a slightly rolled off bottom end... but that was for a reason: The big danger here is that very low frequencies below what this can operate at will cause very high stress and power wastage with the EQ. For safety and to avoid this I've put a 2nd Order HPF in before the EQ, and increased the Q of this filter a bit to work with the theoretical 2nd Order of the EQ'd Sealed Box to create a 4th Order system with a sharper cut-off. Theoretically the cut-off of the whole system is 14Hz meaning that it should be flat (obviously not with room modes!) within a dB by 20Hz. The final stages (inserted in-between the pre and power amps) are as follows: 2nd Order HPF (creates 4th Order system overall), Invert (next stage inverts back) and 7KHz LPF (clean up input), Linkwitz Transform EQ. 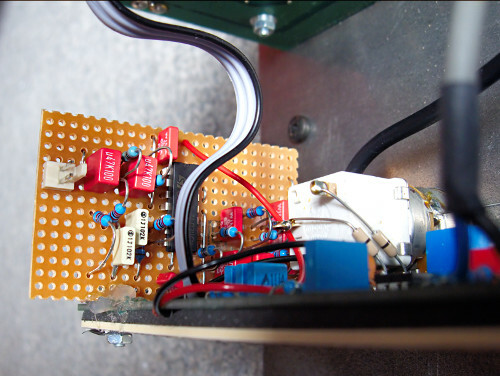 This was put together and glued in place, with connectors to use the existing Audio and Ground of the BK Amp, and soldered into the low-voltage supplies. It's an interesting experiment that looks rather smart with a grille hiding the Car Audio driver and Lacquered Light Oak veneer. So far as I can measure (not got anything calibrated at 14Hz!) it's performing within the right ball-park specs with substantial output down to 14Hz. 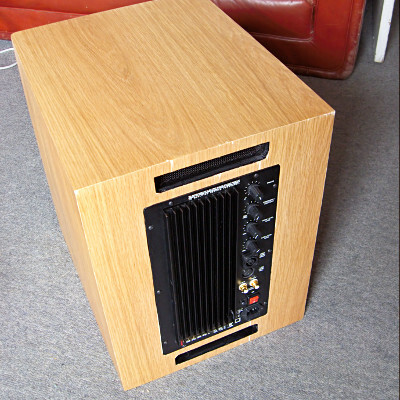 In practice with normal domestic listening levels it's more than capable, and for about £140 (much of which was the cost of the real wood veneer) it's a bargain for what it does. Paired with my existing vintage Leak TL12 monoblocks powering the main speakers, the bass is exactly as I want it - not exaggerated, but with no loss on lower notes. The famous Telarc 1812 track is fantastic, thought he entire enclosure jumps about a cm when the canons fire - guess I need to look at anchoring it better. One other idea I had but wasn't practical with the amp was to get two drivers side-firing outwards. This would mean that the motor forces would be opposite and cancel, plus twice the surface area. Without an amp that can drive 2ohm loads I opted for a single front-firing driver. Before someone asks, I'm not intending to publish full details of the design since without the exact same type and amount of wadding and construction you will not achieve the same results. The principle is what I am putting forward: with some very simple design using freely available design tools and maths, extreme low frequency performance is possible at minimal cost.